Geradliniges American IPA. Mit Warrior gebittert, mit Simcoe abgerundet. Keine Kompromisse. Dryhopping for president. 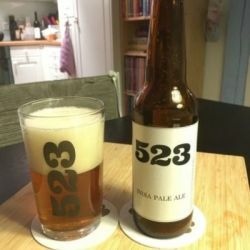 Shared at a tasting, thanks anstei, stable slightly dense frothy head, murky dark orange and green color, as though the dried hops where left while bottling, shrubby green aroma, green hoppy flavor with wood, shrubs and a hint if tobbaco, light bitterness that becomes a bit abraisive. Nice but messy. Bottle sample at a tasting at Yoav's place. Thanks tomer. Gusher, murky orange, slightly green, with bubbly beige head and lots of sediments. Very hoppy aroma with notes of dunk, wet hops, "green", citrus (o), somewhat skunky. Sweetish flavor, harsh green bitterness, grassy, leaves, rotten orange, onion, very "green", some malty sweetness, bitter finish. Gritty texture, medium-bodied. Bottle sample at a tasting. Thanks tomer. Gusher. Murky orange, tons of floaties. Very green hops aroma. Taste of hops juice, very green, herbal, onion, bitter finish. Medium-bodied. A bit messy. Bottle sample at a tasting at Yoav's place. Thanks tomer. Muddy green-ish brown with hops floaties. Very "green" hops, fruity, light sweetish note, strong "green" bitterness in the aftertaste, floaties in the mouthfeel. Messy but still kinda OK. I drank this beer at the Pibar, Lausanne and I drank one bottle that I took from beers no more in Zürich between two trains and I drank it on friday at home. In my point of view, it is a decent IPA, well done, classic and well balanced. The colour is copper/brown, white foam, normal carbonation for the style. The taste is clearly a resinous one, sugar, counterbalanced by a powerful bitterness, malt. The finish is dry and sweet, I simply like it, best before 11/2017. Pours very hazy, amber color, topped with a very large off-white head, very creamy and lasting. Moderately strong fruity aroma, sweet notes of peaches and resin. Mildly sweet, a bit fruity with quite gentle hoppy bitterness. A bit of warmth in the very finish, though very gentle. Almost no aftertaste. Medium body with bland carbonation. Guessing its not very fresh, this one. Still nciely enjoyable. Pours a thick hazy, dark copper, with fine sediment. Very hoppy aroma. Lacking in carbonation? Good, but falling short (reminds me of a flat BrewDog Punk IPA). In my UNprofessional opinion I would say this beer has either not been bottled long enough or properly. Bottle from my Secret Santa anstei. Many thanks! Moderate caramelly malty sweetness, relatively high general fruity esterss. High bitterness, lots of fruity hops character, juicy, berries. Finishes zesty with a touch of (hoppy) sourness. Good one. Bottle kindly shared by Gurthnar, many thanks. Orange golden color with medium white head. Aroma of caramel malt, light citrus hops. Taste, caramel malt, citrus hops, zest, pines. Long citrus hoppy bitter finish. Good. 330ml bottle - thanks martjoobolut and ultimately his secret santa SinH4! Starchy aroma, sweet childrens sweets zestiness. Simple sweet malty body, fruity hops. Full body. Finish smooth and citrussy, nice zesty bite. Erm, does cover the alcohol, but nothing here to interest me.